Bring out the crayons, markers, paints and such to make early childhood jellyfish crafts with your students. The children's artwork can be used as decorations in the room either hung from the ceiling or placed on bulletin boards. 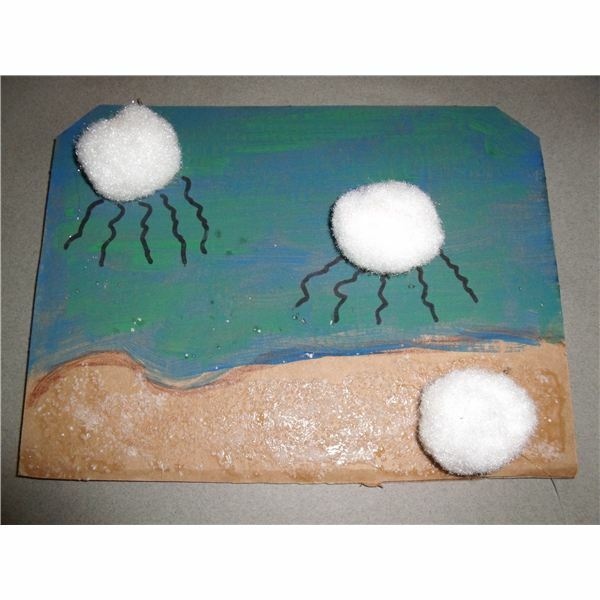 These artistic replications will complement your teaching about jellyfish this season. Give each child a small piece of cardboard. Invite them to paint the upper portion blue for the sea and leave the bottom part brown as the sand on the shore. To the sand part, spread glue and sprinkle on some beach sand if available. In this photo, we used Kosher salt for a textured look on the sandy shoreline. Next, glue on white pompoms or cotton balls to represent the jellyfish, some in the water and some on the shore. When totally dry, use a black marker to draw tentacles. Each child will need a paper plate that has been cut in half. Remember jellyfish have that umbrella appearance. Let the children decorate the plate with crayons or markers, making dots, ovals or squiggle lines in shades of blue, green, purple and pink. Jellyfish appear to have an opal-like coloring. When the children have finished decorating, tape a piece of bubble wrap over the paper plate, giving the project a jelly type appearance. This can be taped on. Provide pieces of blue curling ribbon to tape to the back of the plate and hang down as tentacles. Provide each child with a coffee filter where they can draw colorful lines along the edge with crayons or markers. To the filter, the children can tape on lengths of blue crepe paper streamers as the tentacles. 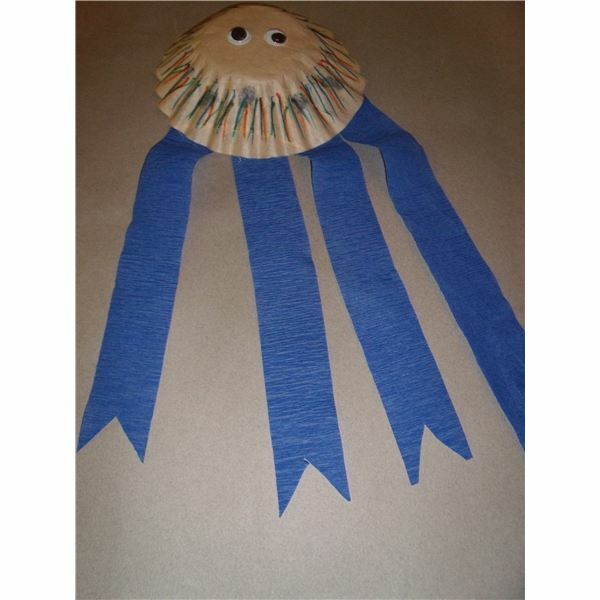 Real jellyfish do not have eyes, but since this craft project is like a friend to the child, let him glue on googly eyes or ones made from construction paper. After completing these crafts, you can incorporate your newly created jellyfish into other activities. A jellyfish is not a fish. It has no body organs like a heart, brain, ear or even bones. It is composed of 95% water. They live mostly in the water in tropical areas and in the icy Polar Regions. Jellyfish look like an inverted umbrella of clear gel with tentacles hanging down in the ocean. On the shore, it looks like a shapeless blob. Jellyfish capture their food (other sea creatures and small fish) with the tentacles, which shoot out poison to get their prey. Unfortunately, if a person gets in contact with jellyfish, the poison from the tentacles causes a painful sting. Children should be taught about jellyfish as being one of nature's creatures in the ocean. There are many non-fiction books with illustrations to show them as well as fun fictional stories that will capture their attention, like Joy the Jellyfish by Kristen Collier and Jenny Jellyfish: A Tale of Wiggly Jellies by Suzanne Tate. You could even have the students use their newly created creatures to characterize the story. In addition, it is important to teach students about beach safety and if they see a jellyfish on the sand, to not touch it and report the sighting to an adult. 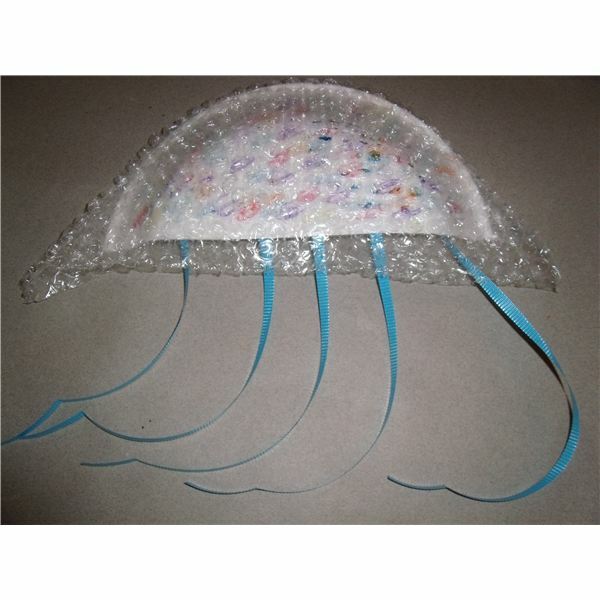 For creative movement, here is a jellyfish activity that is fun for preschool classes. Invite the children to dance like jellyfish in the ocean. The teacher can tape on crepe paper streamers around an opened umbrella to represent the tentacles. Encourage the children (one at a time) to hold the handle and go under the umbrella. Put on some slow music and encourage the children to dance and twirl as if they were jellyfish floating along the ocean waves. They could even use their new paper plate or coffee filter crafts to demonstrate. Please note: Teachers need to ensure safety by supervising the children when holding umbrellas. Make sure the other children keep their distance from the spokes. When preschool children participate in these jellyfish crafts, they are learning about a creature in the sea – their body shape and how they move. When you combine stories and a dance-like activity, the actions of a jellyfish come to life and the children are learning concepts through fun projects.